Parking a motorbike or scooter in Westminster is like complete hell these days. It’s become so bad that a number of anonymous protestors who oppose the bike parking tax continue to deface or even remove the parking signs all over the borough to make the charge unenforceable and thus make the council lose revenue. First, you have to pay £1 to park your bike by shouting out your credit/debit card details to the operator over your mobile phone in the street while doing this in the pouring rain or under freezing temperatures and while everyone around can hear and make a note of those details without you even realising. Second, you have to squeeze your bike into minuscule spaces and in over-crowded parking bays, which has the inevitable effect of damaging your motorcycle and that of other riders. Third, a large proportion of the bike parking signs have been either removed or “enhanced” by angry bikers who believe that the service provided by the council is so terrible that it doesn’t justify a charge whatsoever. Parking bays that have always been free of charge before are now no longer free, and what’s the justification for this? Absolutely none other than make Westminster Council, its parking enforcement contractor NSL Services and pay by phone provider Paypoint (previously known as Verrus), more wealthy. There’s no other reason, it’s purely money, money, money. Lower sign is missing hence information such as the fare to pay or the method of payment is not displayed. The parking charge is unenforceable in the circumstances. Anyway, if you want to park your bike for free in the streets of Westminster while the No To Bike Parking Tax campaign continues to legally make the working life of Westminster Councillors a nightmare and forces them to scrap the tax, why not park your bike in a bay where the parking signs have been defaced, removed or painted over? Make sure that essential information such as (for instance) the phone number to call or the fare to pay, the parking enforcement hours or the bay location number have been obliterated, made impossible to read or the sign itself has been removed all together (see pictures above and on the right for more details). 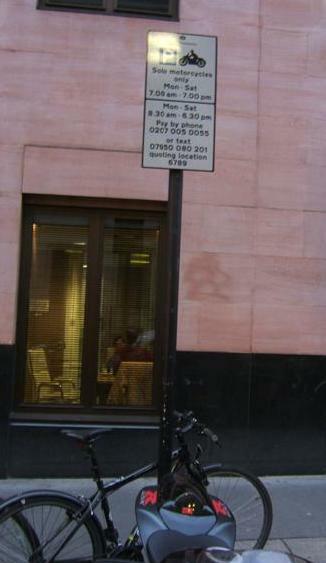 Take a photograph of your bike (clearly showing its registration plate) with the defaced or missing parking signs as evidence in case you need to challenge any Penalty Charge Notice (PCN) that you may have received by a parking attendant desparate to meet their daily PCN targets imposed on them by their employer hungry for more revenue. 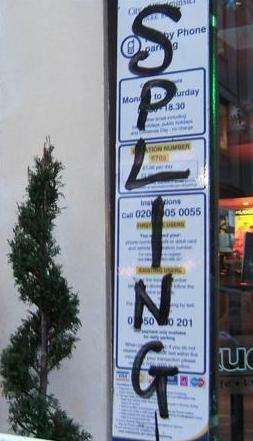 If you do receive a PCN, you should contest it immediately by saying that the information necessary to pay the parking tax was not visible due to signs being defaced or missing. Don’t forget to enclose the photograph that you took of your bike and signs as supporting evidence. While UK France bikers.com does not support or get involved in any act of vandalism against street furniture or indeed anything else, we believe that there is nothing wrong or illegal with parking your bike free of charge in a bay where the signs have been defaced or removed, as the parking charge is not enforceable in the circumtances. If you’re still unsure, then have a look at a letter that was sent to a motorcyclist last year by Westminster Council to advise that the PCN had been cancelled as a result of vandalised signage and obliterated information. That said, we are not encouraging any of our readers to embark themselves onto vandalising the bike parking bays or signs, we are only suggesting that motorcyclists do make use of vandalised parking bays in a more economical manner. Happy parking in Westminster free of charge! I note that most of the lower signs that were removed towards the end of September, still haven’t been replaced. The ‘Splinged’ signs appeared at the start of November; nearly a month has gone by and they still haven’t been replaced. Does WCC know something we don’t regarding the future of the Motorcycle Parking Charging Scheme ?